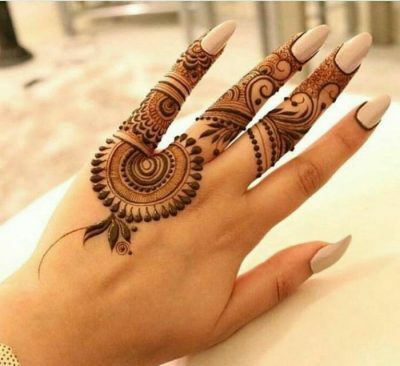 You can highlight your sleek fingers using these beautiful Finger Mehndi designs. 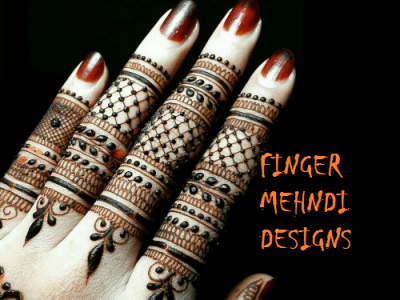 The finger Mehndi designs are smart way of making a style statement using traditional ways. As these designs are specifically applied on fingers therefore they look quite unique and spectacular. The free space helps in highlighting this intricate finger design. 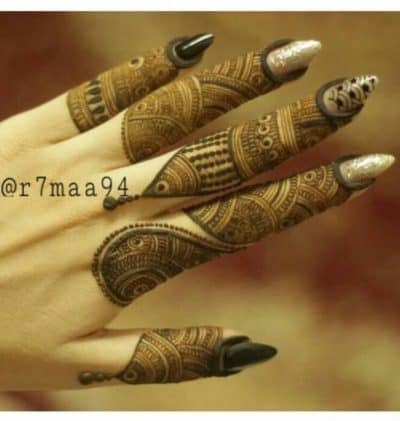 You can decorate your finger in Arabic style, Moroccan style or Indian henna style. Every style looks trendy and magnificent on hands. For different ocassions you can pick different style like arabic looks good on weddding functions and moroccan can be carried easily on regular days. So you have got all the good reasons to wear this finger designs. 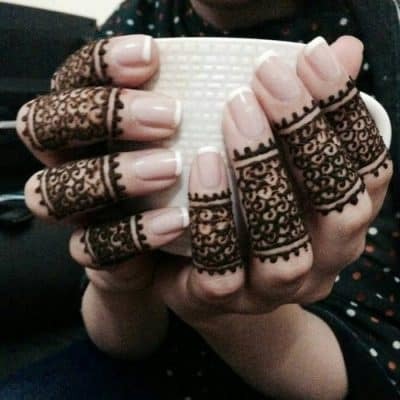 Here we have compiled a list of beautiful finger Mehndi designs for beginners as well as professionals. 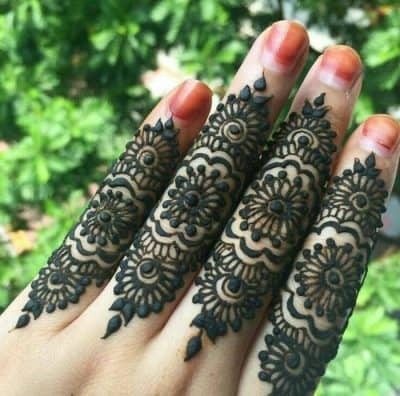 1: This bold and beautiful floral henna design is one of the attractive piece of design for your fingers. It’s quick and easy and gives the effect of the reverse henna design. 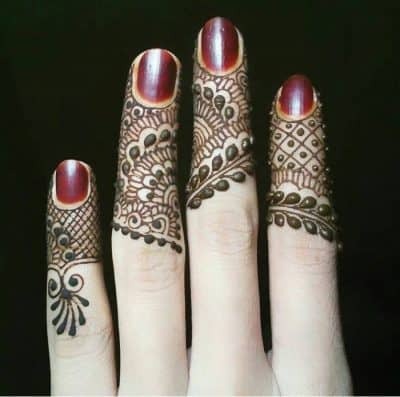 2: This finger ring Mehndi design with fine henna art will surely give a classy look on your fingers. 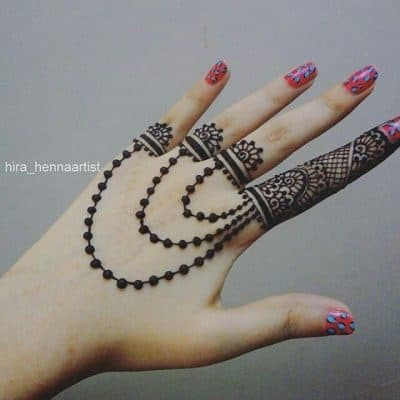 3: Moroccan henna art design for your fingers is one of the simplest and best way to decorate your fingers. This straight geometrical art on fingers give it a chic look. 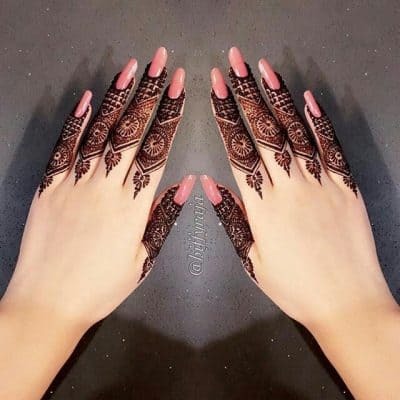 4: This finger Mehndi design is inspired by Pakistani Mehndi art and you can use this design to beautifully decorate your three fingers. 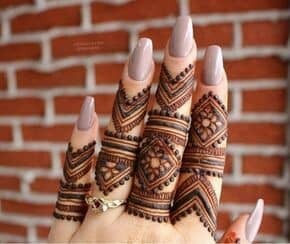 5: If you are looking for an intricate Mehndi design that would beautifully cover all your fingers then this one is for you. 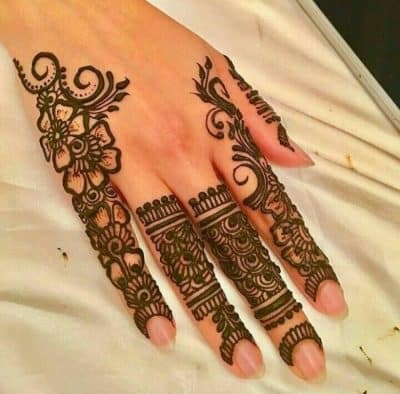 This filler Mehndi design can be used to fill design in your fingers within a short span of time. 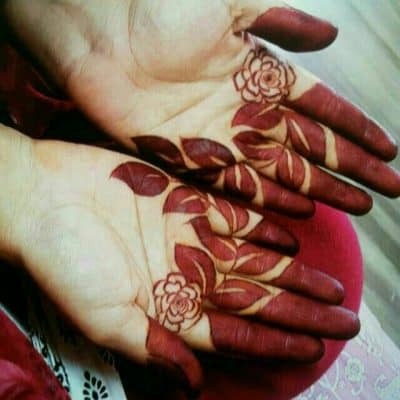 6: If you are fond of the Mehndi color, then you can try this finger henna design. 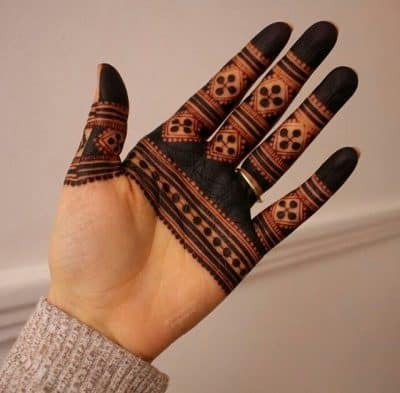 This will help you in flaunting the rich color of the henna. 7: This one is for the professional Mehndi designers. 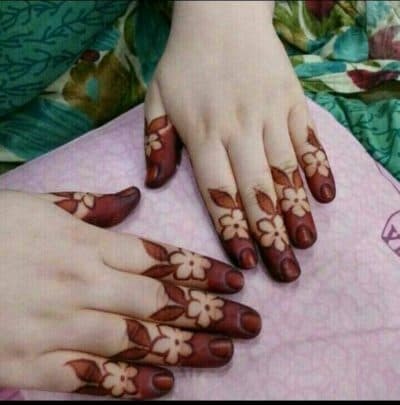 If you have hands of expertise in Mehndi making then this one is a must try. 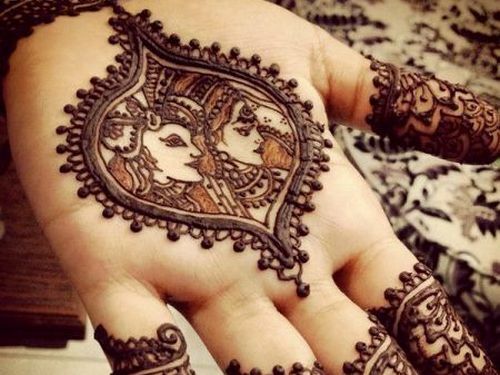 8: Intricate Mehndi design for fingers to give them a refined look. 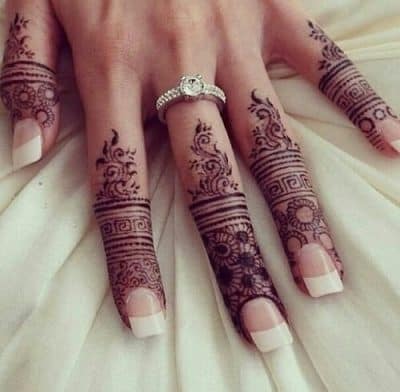 9: Beautiful Arabic Mehndi design for fingers. The flower and vine design for the center finger and ring design for the rest of the finger. 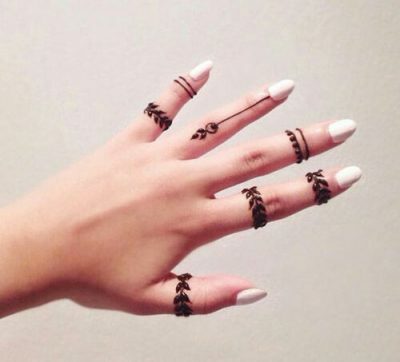 10: Finger Mehndi design is a great option for highlighting your engagement ring. By applying finger henna designs you can bring everyone’s eye on your perfectly manicured nails. 11: You can definitely skip your rings for this magnificent long finger ring design. 12: The beautiful pattern created with the help of floral Arabic Mehndi art is sure to make everyone skip a heartbeat. 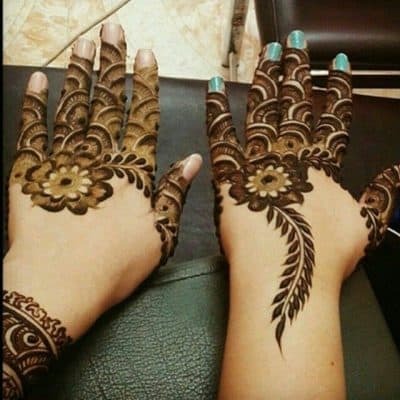 13: Beautiful Mehndi design for the front and the back of the fingers for special occasions. 14: You don’t need costly hand accessories to decorate your fingers. 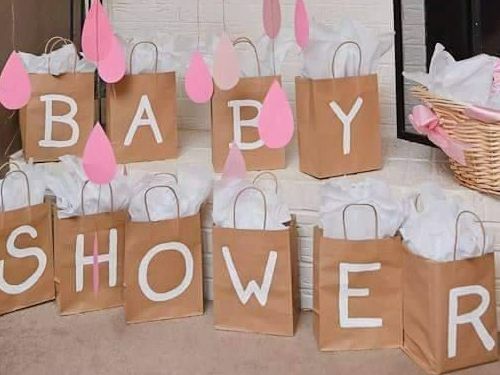 Just a little bit of creativity can help you to get the desired result. 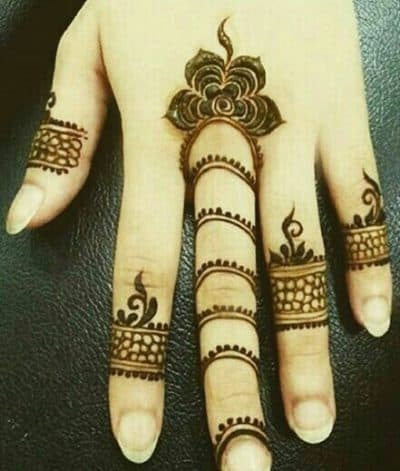 15: Looking for a simple Mehndi design for your fingers, then try this simple one. This design is great for the casual look. 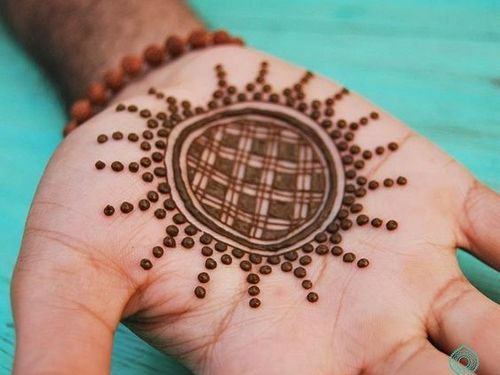 16: This traditional Indian style of Mehndi art for decorating the upper half of your fingers. 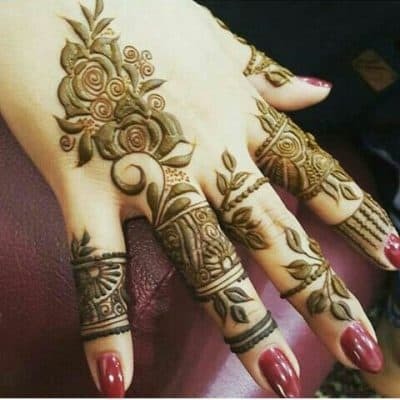 17: Arabic Mehndi style with beautiful rose designs for decorating the fingers. 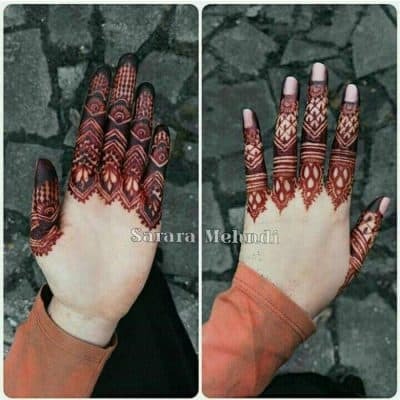 18: Moroccan Mehndi art design for the fingers and the wrist. This design is sure to give your hands a sophisticated look. 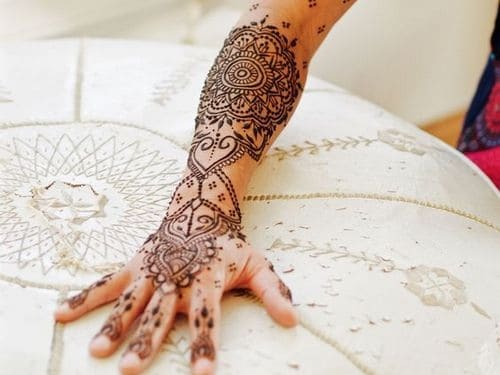 19: Beautiful Moroccan Mehndi design with a blend of fine art and bold Mehndi fillers. 20: Special fingers Mehndi designs: Fusion always creates something new and refreshing. Mixing of geometrical designs and free hand leaves has created a unique design. 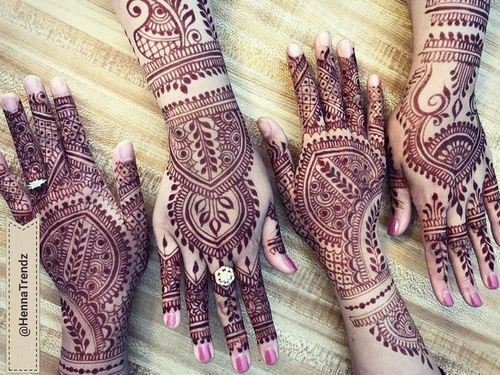 We hope that you enjoyed our list of beautiful finger Mehndi designs. 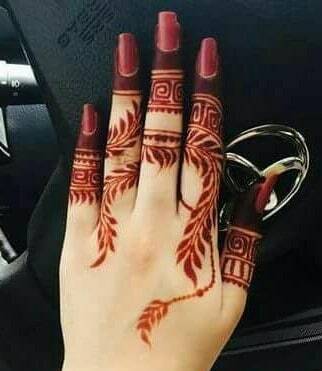 These finger Mehndi style will surely add a charm on your hands and will create a unique, distinctive look. 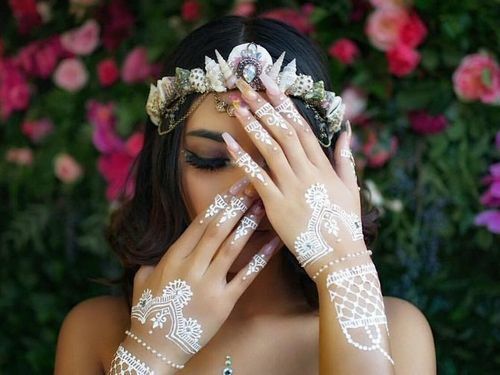 Click here to see more stunning Mehndi art designs of 2017 from different parts of the world.